The holiday season is upon us! That means family time, gifts, food– and lots of it. But that also means spending a lot of time preparing copious amounts of food. Try these three easy dessert recipes to satisfy your sweet tooth and are the ultimate time saver. Pumpkin Cranberry Bread Pudding: Yes, it’s as yummy as it sounds! Soak up the flavor of cranberries, spices and pumpkin with this golden-crusted bread pudding. Prepare the dessert in a crockpot to save even more time in the kitchen. Vanilla Custard: This simple cooked custard with a hint of vanilla is the perfect pairing for fresh seasonal fruit and crumbled gingersnap cookies. Or add different toppings for all of your holiday needs. You can even use lactose-free milk to allow those with lactose sensitivity to enjoy a delicious dessert –without skimping on the taste! Hot Chocolate Dip: Who says hot chocolate is just for drinking? 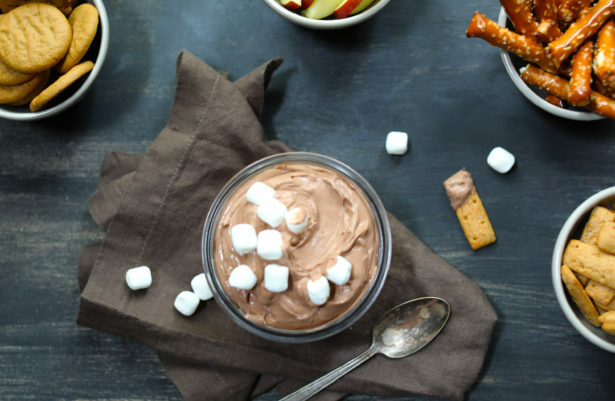 Whip up this simple, not too sweet hot chocolate dip that people of all ages will enjoy. Pairs perfectly with fresh fruit or go for the sweet & salty with pretzel rods. These dessert recipes are a piece of cake (actually they’re easier)! All three are perfect for holiday parties, family gatherings or intimate events all while spending less time in the kitchen this busy holiday season. For more fun holiday recipes, visit thedairyalliance.com and follow us on social media. Happy Holidays!